In a Nutshell: Manufacturing products via 3D printing has created a low-risk entry point into the marketplace for entrepreneurs. Using computer-aided design (CAD) or built-in applications, digital designers at every skill level can upload their creations to the Shapeways platform, allowing consumers to customize the product by choosing from among more than 58 materials and finishes — from plastic to porcelain to precious metals. Shapeways lets makers focus solely on designing pieces while giving them the option of adding their work to its online marketplace. Shapeways then handles the manufacturing, shipping, and customer service, creating a hassle-free business model for 3D artists. By unlocking new possibilities and encouraging individuality within the marketplace, 3D printing is allowing makers of all skill levels to bring their ideas to life. It wasn’t long ago when entrepreneurs interested in jewelry or accessory design would need to invest a large amount of resources and capital into launching a business. Most jewelry isn’t cheap, and much of that is a direct result of the material, manufacturing, and labor costs that go into handcrafting precious metals into wearable works of art. One professional jeweler interviewed in an Inc. article about starting a jewelry business said $20,000 was a conservative estimate for starting in the industry — a figure that leaves out the additional costs involved in opening a brick-and-mortar storefront. This is where 3D printing is a game changer, and not just in the realm of jewelry. Creators of every skill level can use CAD software to create unique products, and 3D printers produce them in a wide range of material options. Aimee Moyer, Merchandiser at Shapeways, told us many users start their businesses for less than $1,000. 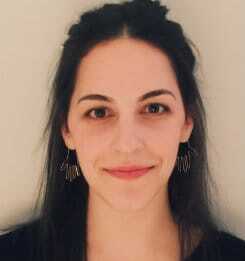 We recently spoke with Aimee Moyer, Merchandiser at Shapeways, who told us 3D printing can be a low-risk way of entering the market for creative entrepreneurs. “We took a survey a couple of years ago of users and over 25% of our community members had started their small business on less than a $1,000 investment,” Aimee said. Shapeways, a New York-based 3D printing company, gives designers the ability to print one prototype at a time in their choice of more than 58 materials and finishes, ranging from plastics to precious metals. On the site’s marketplace, consumers purchase and browse unique, often entertaining creations from designers within the Shapeways community. “Our core platform is building on this idea of bringing the power of production to the general population, specifically through 3D printing as a medium,” Aimee said of the inclusive nature of the Shapeways business model. Shapeways’ goal is to remain as accessible as possible with a range of design options for beginners through professional 3D animators. “Whether you’re a tinkerer and have no idea what 3D printing is or you’re well familiar with 3D modeling, everybody is welcome to come in and bring those ideas to life,” Aimee said. Shapeways highlights more than a dozen design applications that simplify what can be a complex process for those making their first forays into 3D printing. “If you’re super basic and have no 3D modeling skills, we have apps on the site that people have created — whether it’s our community or Shapeways developers — to create a pendant or a ring for example,” Aimee said. For those who have elaborate ideas and may not have the time or design skills to properly achieve a particular project, Shapeways hosts a designer for hire program. Interestingly, Aimee told us that many experts within this program are self-taught, spending years researching 3D design techniques by immersing themselves in online message boards and how-to videos on YouTube. Shapeways offers options for every skill level of 3D design, even allowing consumers to hire designers for custom items. “Once you dabble and realize the possibilities, it’s taking baby steps to get to the point where you’re digitally sculpting, so you can get what you really want that you’re not getting out of a sketch,” Aimee said. More advanced designers can create models using CAD and upload them to Shapeways, which features automated checks for printability, wall thickness, and mesh integrity, as well as instant pricing for each material option. Once a design has been uploaded to Shapeways, makers can choose to include it — or not — in the Shapeways marketplace. In some cases, privacy is an important choice. For example, a designer might upload a customized wedding band that is intended to be one-of-a-kind for that special someone. In other cases, the ability to make their work public through the marketplace paves a lucrative path for entrepreneurs. Shapeways essentially becomes business partners with 3D designers, handling manufacturing, customer service, and international shipping. Creators maintain the rights to their design and choose the markup from production cost, earning a monthly check from Shapeways based on the number of purchases. Community-designed items, such as earrings, pendants, and bracelets, can be found on the Shapeways marketplace. While jewelry is a popular category on Shapeways, the marketplace features a wide array of unique, community-created products. Other popular categories include miniatures, accessories, game pieces, and art sculptures. Designers who prefer to sell Shapeways-printed items on their own URLs have the option of integrating with the Shapeways API. One popular company that uses Shapeways’ printers is Hero Forge, a site that specializes in letting people create their own customized miniature characters for use in tabletop RPG board games. Initially funded by a Kickstarter campaign, the founders of Hero Forge chose to integrate with the Shapeways API so they could focus all of their energy on designing new character templates instead of dealing with shipping and manufacturing. By becoming the fulfillment arm of companies, Shapeways simplifies small business. If you create a design on Shapeways and choose to feature it on the marketplace, customers can find your product, customize it by using available printable material, and place an order. Shapeways will then print it to exact specifications, ship it to your customer for you, and deal with customer support issues as well. It’s an eco-friendly process as each sale is made to order, eliminating the need for maintaining inventory. According to TechCrunch, 30% of all manufactured products are never sold and end up in landfills. With Shapeways, products aren’t produced until someone has bought them. The print-on-demand format also encourages creativity by eliminating the risk associated with large product orders from overseas factories. “You don’t have to go offshore and place a bet on ordering 100 pieces that may or may not work out,” Aimee said. Where 3D printing shines is in customization and low initial investment for entrepreneurs. Makers can design virtually any product within the parameters of Shapeways’ printers, manufacture it in the material of their choice, and receive a finished product within days. Mass production surely has its benefits, and 3D printing might never match factory production on price per item, but the ability to create unique items has never been simpler. It may sound like a bold statement, but some observers believe that 3D printing is the next industrial revolution. To help further this growing trend in 2017, Shapeways plans to recruit new makers and facilitate their innovations by giving 3D designers the limitless power to create on its platform. 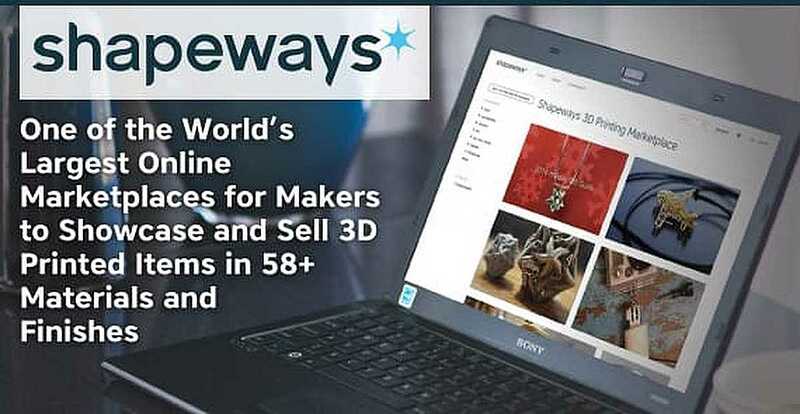 Members of the community can earn money by selling their creations on the marketplace, and Shapeways takes care of order fulfillment.